Up for review today is the Four Kicks Limited Edition 2018 Maduro by Crowned Heads. For those reading who don’t know, Crowned Heads is a boutique cigar company that has released other popular blends like Headley Grange, Jericho Hill, and J.D. Howard Reserve. I’ll cut right to the chase and just mention that this is definitely a cigar to investigate, some minor construction issues aside. The cigar is priced at $10.95 with a total production of 30,000 cigars (that means pick it up while you can). Note: the cigar uses the same binder and filler as the original Four Kicks line, though with a Connecticut habano instead of an Ecuadorian habano wrapper. The Four Kicks Limited Edition 2018 features a deep, rich brown Connecticut Habano wrapper which has a few small knots and imperfections, a touch of toothiness and has a nice layer of oil. The cigar isn’t quite constructed evenly, just looking at it from the side reveals some waviness to its overall shape. But it is packed evenly. The branding is a nice touch as well, using a red and gold Four Kicks upper band and a black and gold LE band that is popular on many cuban cigars (as well as their knock offs). I used a straight cut on this cigar, and the draw is ideal, about a 6/10 in terms of restrictiveness. The cold draw reveals notes of granola, baking spices (cinnamon), pepper, some cocoa and a bit of bread. The Four Kicks Mule Kick LE 2018 opens with a dominant combination of cream, cocoa, and a strange tangy fruitiness. There’s also a heavy charred wood and white pepper which enters fairly aggressively after about the first five minutes of puffing on the cigar. The texture of the smoke is very earthy, but still quite smooth. Smoke production is excellent, and the strength seems to be dead centered on medium. All of this amounts to a lot of flavor, a good deal of strength, and ample reason to get the salivary glands going. The burn is mostly alright, but once or twice it goes a bit sideways forcing me to touch it up. Burning into the second third, the earthiness of the texture morphs into something more akin to cream, pairing well with the chocolate and dark berry notes. On the other hand, many of the sharper notes in the first third (earth, wood, pepper) have toned down or entirely disappeared, and the body which was medium earlier is now a touch below. I’m a bit torn on whether I’m happy about that. The rougher notes provided a nice balance to the creamier flavors. Construction wise, the burn continues to wave one way and then another, but thankfully doesn’t affect the draw, smoke production, or flavor. The last third of the Four Kicks LE 2018 sees a reduction in creaminess and leans more toward something akin to dry wood. There’s a hefty amount of granola, as well as leather, along with some nice salted nuts. It’s an enjoyable profile, and it’s augmented from time to time by a freshly baked bread note that adds to the enjoyment. Construction is never quite perfect on this cigar, and the burn continues to need attention even in the last inch and a half. I’ve been disappointed by many limited edition annual released from other companies. Thankfully, the Four Kicks Mule Kick Limited Edition 2018 is a solid offering. It’s a bit of an enigma at times, with the flavors and balance shifting almost without end at times. I also think it could do with a bit more strength as it never really passed above the medium mark. Overall though, the cigar puts forward a great flavor profile that’s easy to recommend and return to. 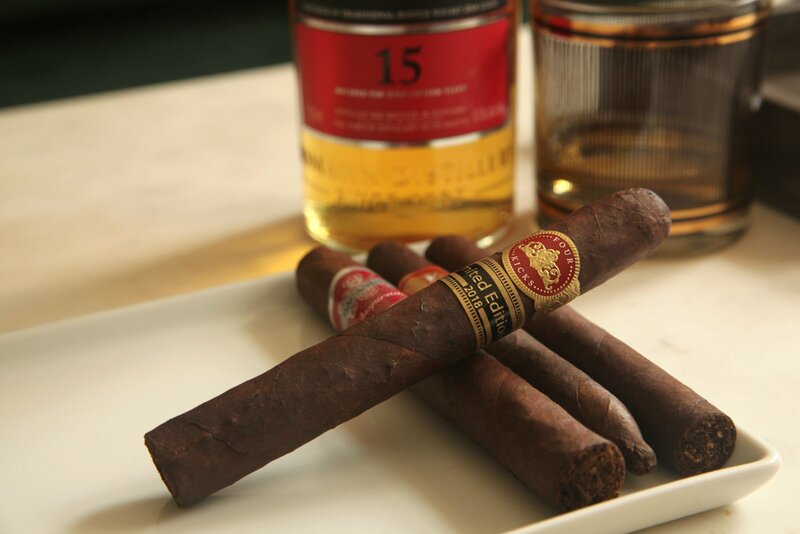 On the pairing side, this cigar pairs well sherry-influenced scotches. I’ve paired this cigar with the Glendronach 12 Year with great results.